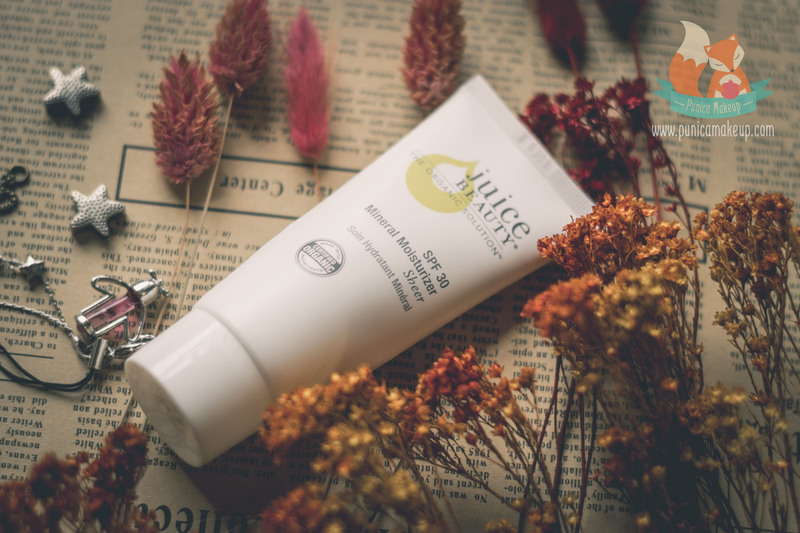 Juice Beauty is one of my 5 favourite certified organic brands that I mentioned before for using high-quality and ecologically minded ingredients. Most of its’ skin care products are enriched by natural, botanical juices as powerhouses of vital vitamins and minerals without cruelty or hazardous toxins. Recently, I’ve been using the Juice Beauty nutrient moisturizer and antioxidant serum for nearly 4 months, the results are shockingly amazing. I’m looking forward to exploring more and more it’s fantastic products. In early March, I bought the brand’s sunscreen; however, after a couple of months, I gotta say the product doesn’t make me totally gratified. 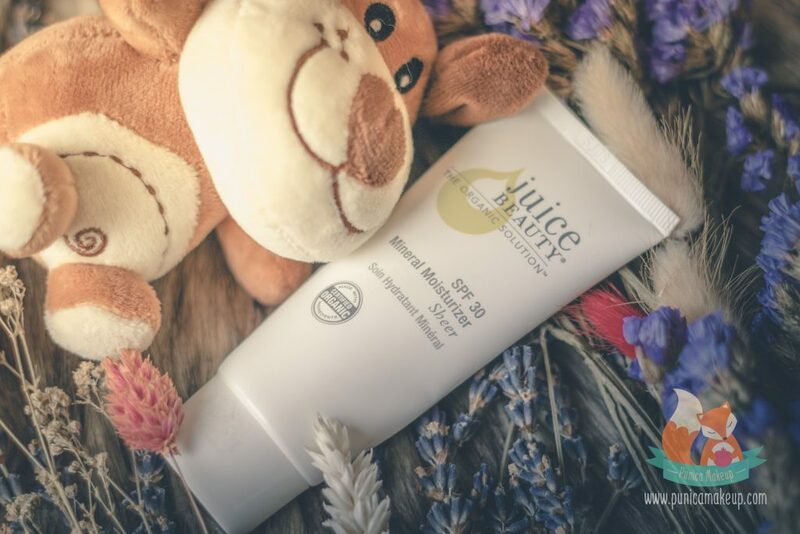 Then, in this post, I’m gonna share a review of Juice Beauty – SPF 30 Mineral Moisturizer – Sheer Sunscreen. At the moment, I switch to the Innisfree – Perfect UV Protection Essence Water Base SPF 50+ PA+++. I feel much better and more comfortable than before. The sunscreen does its’ job as a 4 in 1 multi-tasking BB cream for moisturizing, sun protection, age-defying and light coverage. It’s exactly like tinted moisturizer infused by organic plant oils of coconut, jojoba and sunflower. Also, nourishes skin with vegetable hyaluronic acid. All of these plant-derived elements are very gentle and hydrating toward delicate skin against dryness. Moreover, the product provides a physical blocker rather than chemical filters to ensure an absolute safety for sensitive skin. It majorly contains zinc oxide, which occupies 20% as active ingredient to defend skin from destructive UV rays. It’s really good that you’re utilizing physical or mineral sunscreens for your skin’s sake. Basically, they include titanium dioxide or/and zinc oxide. Majority of sun creams on the market are made of chemical UV filters, such as oxybenzone, homosalate, octocrylene, avobenzone, octisalate and octinoxate. A 2014 research of Environmental Working Group of America states that oxybenzone is the most found in the chemical sunscreens in the U.S. Furthermore, the organization also warns that your skin can absorb it deeply and is more likely to get allergic reactions with it. Many dermatologists encourage to use physical sunscreens that capture zinc oxide. Dr. David Herschthal, M.D., Professor of Dermatology at the University of Miami School of Medicine emphasizes that zinc oxide is a superb physical blocker we need for a wonderful broad-spectrum shield. It also delivers rejuvenating properties to dampen the pre-aging process due to UV rays from fruity juices of apple, grape and aloe. The product also tends to even out the skin tone as well as bring about radiant surface with a lightweight, mineral coverage. All of those enable you to pursue a youthful and healthy look. The sunscreen is preferable to normal, sensitive, dry and mature skins. It has 4 shades to pick sheer, ivory, sand and tan. One more thing, because it’s a physical sunscreen, you have to reapply in the middle of day before sun exposure. At the time of using this sunscreen, my skin was a type of very sensitive and freaking flaky with severe redness, cracks and dry patches. I looked really horrible, usually got itchy and irritated all over my face, especially cheeks, chin and forehead. It felt extremely tight and uncomfortable after cleansing. I wished to scratch my skin all day; but my mom stopped me because that could worsen the situation. I bought the Juice Beauty Mineral Moisturizer broad spectrum SPF 30 and hoped it would hydrate my skin well and also, give a unharmed sun protection to my delicate skin. Visibly, it has a thick, very creamy base with completely white consistency. I picked the shade sheer, which is designed without giving color or tinted coverage. When applying onto skin by fingertips, I didn’t like it at all actually. The cream made my face look kinda odd and unhealthy, it was really difficult to spread out evenly and sit on top rather than sink down into skin texture. Also, the cream smeared to my hand a lot. My face looked full of white with an overwhelmingly luminous finish, sadly which wasn’t a natural look I crave for. The cream didn’t neutralize discoloration or give a lightweight coverage, not at all. It brought about thick, heavy and greasy sensations once apply all over my face. You might need to wait after few hours, these feelings would go away. But, white creases and patchy marks tended to appear on my forehead, brow bones, nose and jawlines. It’s NOT blendable and buildable, the product is really no-go for oily skin. To be fair, the sunscreen provides an incredible protection against external aggressions, especially UV rays. During 2 months, it didn’t aggravate redness or cause rashes around my cheek at all. Honestly, I used to quit many sun creams because my skin couldn’t stop itself to react badly. They were inclined to cause more pimples, inflammation, itchiness or sweating. 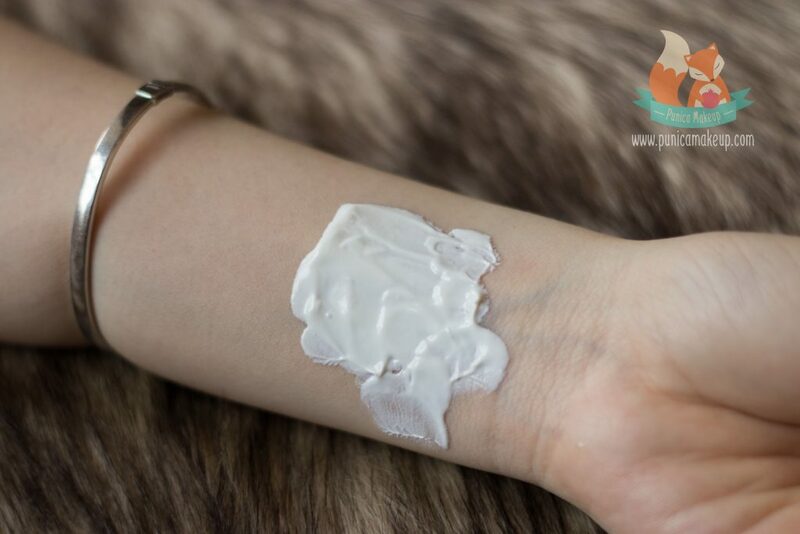 Otherwise, the mineral moisturizer ’s formula is mild and amiable, then, no need to worry that your skin will be raged on or suffer from allergies. Gotta say this is an ideal sunscreen for sensitive, fragile skin. Under sun exposure, it literally prevented my skin from getting damage by sun exposure, like hyperpigmentation, irritation or feeling burned. The product definitely wouldn’t bring any harms or negative reactions to my complexion I can tell. But, it doesn’t mean helping my situation to get better. The sunscreen’s moisturizing property isn’t strong enough to combat flakiness and serious dehydration. It didn’t worsen my redness or made it disappear. After 3 months, my skin was still insanely dry and pathetic, didn’t change a thing. The description tells you can apply the cream soly, without moisturizer. For super dry skin, I don’t think this is a good idea. This might be go-to for normal, sensitive, mature and slightly dry skin. At the end of the day, my skin looked terribly drained out and the cream usually clung to some little peeling skin and cracks, especially around my chin. It’s water resistant and able to last for 6-7 hours. Speaking of the smell, this is hard to describe, the cream has unpleasant odor, which may reduce when blending out. I don’t know if you guys are interested to buy the Juice Beauty Mineral Moisturizer broad spectrum SPF 30, I think it’ll be better to choose other shades outside the sheer. The product comes into a squeeze tube, having a whole matte white color and printed brand name, logo and lable of certified organic. It also shows clear product details on the front and back of packaging. The tube has a medium size for 60 mL, handy and not too big to take a lot of rooms in your bag. It’s soft and easy to squeeze; but also tough to withstand damage when carrying around. The packaging looks always clean outside. Currently, I’m using another sunscreen with stronger moisturizing property. The Juice Beauty – SPF 30 Mineral Moisturizer – Sheer is extraordinarily friendly toward skin, particularly delicate ones. And, provides many skin care benefits. However, it doesn’t have good makeup effects of BB cream that I couldn’t stand for. So, I’ll give it 7 out of 10. You can get to know more about its’ price right below. This is my very personal points of view about the product. It doesn’t work for me; it doesn’t mean it won’t for you. Just try and experience the sunscreen. I hope this post is helpful and informative for you. If you’re using it or have questions and ideas, please let me know your thoughts. I’d love to hear you out. Thank you so much for spending time with us.